The largest annual conference for technical professionals who leverage the Microsoft Data Platform, PASS Summit, is happening again on 6-9 November in Seattle, USA. We are one of the proud sponsors of the event. As sponsors, we are happy to offer you a discount of the registration fee. 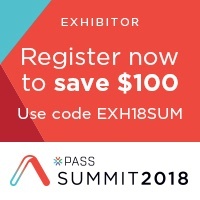 Register now to save $100 by using the code EXHI18SUM. You can see the SQL Governor solution live at the event, by visiting our booth # 600. The solution has a lot of new features that support the consolidation and right-sizing planning of SQL Server platforms. Are you a data-professional working with Microsoft technologies? If the answer is yes, then this conference is a must-attend event: you can deep-dive in technical sessions, learn best practices, and discover new tips and tricks. And not only do you have the opportunity to network with the world's top experts throughout the event, but also with Microsoft's own engineers. It would be great to meet you at the event and talk more about how we could help you with your SQL Servers!